Godiva was adopted into her forever home. 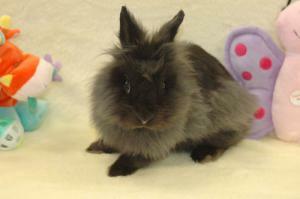 Sweet Godiva, a beautiful black Lionhead rabbit was found at an area shelter. We noticed her in one of those horrid wire cages. Her little face and one eye is all that we could see - that was enough. We called to find out more. She is just a youngster, abandoned in a field - that is all it says on her paper work. Godiva had a terribly abscessed bite wound on her back - some predator most likely had attacked her. We rescued her immediately because due to her injury she was slated for euthanasia. On intake we noticed the severity of the injury and took her to Adobe Animal Hospital where Dr. Nakamura put in a drain and cleaned out the wound as much as possible. This was only the first of several surgical procedures that Godiva required. Godiva's wounds were more serious than we first thought. Cat bites can cause severe damage when left untreated, and abandoned bunnies often suffer from infected bits. We worked on flushing her wounds and finally , as the wound would not heal, she went in for one last surgery with Dr O'Day to remove the abscess which has encapsulated on her back. Dr. O'Day performed her final surgery which was completely successful. The long three inch incision after the surgery testifies to the horrific extent of the damage under her skin. 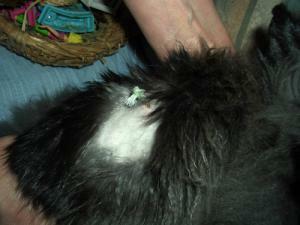 Godiva has been on antibiotics and her sutures have been removed. She is a very healthy girl. Just last month she was spayed. Thank you to Ray and family for overnight guest status and transport to her surgery. 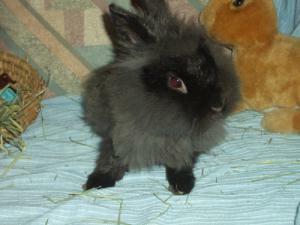 Godiva is happy, healthy and ready to find a loving special home. This charming girl is amazing. She loves communicating and is very vocal. She is a super energetic fun bunny. This sweetheart has been such a strong girl though all her procedures, medications and surgeries. She has made it! Yay Godiva! She is truly as sweet as chocolate.